You’re still juggling a lot and need another route to de-stress rather than watching the television or eating something you shouldn’t. 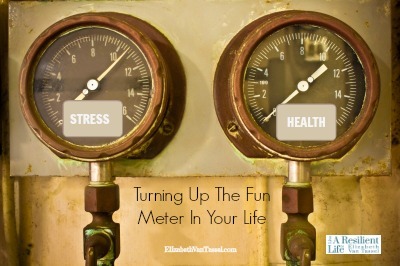 To find that smile again, try turning up the fun-meter in your life. Sometimes it’s okay to completely alter your personality for a day and push pause on the responsibilities, even if only for a short while. You can totally reset the gauges that measure stress and healthfulness in your life with setting out a path to have more fun. Kids don’t mind asking for it, so why, when we grow up, do we suddenly forget to include fun in our daily agenda? Get out of your comfort zone. I mean, it’s time to dial in some ridiculous. I have writing friends that dye the end of their hair different colors to feel like their main characters. I know others that visit different doughnut shops and rate the products. Another friend hosts American Girl parties for her daughters. Press the edge a bit and find a new avenue of joy. Get ridiculous. To venture into the ridiculous, you’ll need to pull the ripcord on being completely safe. You may need to don a tiara or let your kitchen get covered in ingredients that will bring a smile to a weary neighbor or friends. In our family, we try to plan quarterly outings to museums to learn some thing new about art or culture. Whether it’s riding a roller coaster or something else that tickles your inner child, get it out and wear that crazy hat or play a childish tune on the piano. Get messy. Yep, it’s time to pull out the paints or whatever you enjoyed as a child. I’ve recently started painting again and really, whether or not anyone ever sees my work, just mixing the colors is a lot of fun for me. My kids notice the change in me, too, and want to paint together. I also recently got some bubbles on sale at the store. I’m waiting for that dull afternoon to pull them out and get everyone laughing. Whether it’s at the gardening store, or taking a class, invest in creativity to help amp up the sanity in your life. Get down low. Like the song, “Say, Geronimo!” you may need to jump into something new. If you have little ones get down on the floor and play games with them. Pull out old board games or cards and revive the fun of the past. Invite some friends over for appetizers and pull out the games. I love seeing different aspects of personalities come alive in this context. It uses a different part of the brain and helps me loosen up a bit, too. Get musical. Whether it’s putting on music in your home or ordering a soundtrack to a fun movie you’ve enjoyed, music can lift your spirits right away. Recently we took our boys to the symphony and they loved the upbeat jazz tunes too. Music is attainable for everyone and ushes in a renewed perspective with a new tune. Hope these tips will inspire new thoughts about having more fun this week! Let me know what worked for you, too! Image courtesy of coward_lion at FreeDigitalPhotos.net. Thanks Darlene! Yes I sometimes borrow a friend’s daughter to have a tea party or do something girly (since I have boys). Today I tried on tiaras with one and it was so fun, for an upcoming video on YouTube. You never know where the giggles will come from!